Born in Newcastle, South Africa, Paul started out with South African side Wits University, making some 140 appearances in three years. He joined Leeds United in 1995 but found it impossible to break into the first team. After loans to Crystal Palace and Bradford City, he spent some time back in South Africa with Jomo Cosmos. In 2002, he returned to the UK with Huddersfield Town, before joining Sheffield Wednesday. 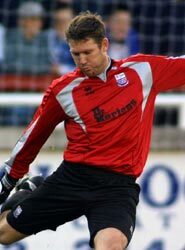 An injury to Kevin Pressman provided him with the opportunity to make his debut, although he was limited to just 7 games for the Owls. Paul joined Diamonds on non-contract terms in 2003 as cover for Billy Turley. When Turley picked up an injury in the game at Blackpool, Paul arrived on a one month loan deal from Wednesday on 13 October 2003. He was drafted into the first team for two league games as well as a cup game – the loan deal eventually extended for another month. Paul himself picked up a shoulder injury, meaning Jamie Ashdown was brought in on loan, and Evans’ services were no longer required. He went on to join Bath City in 2003, where he remained for five seasons. He suffered a knee injury which kept him out for several months in December 2008 before deciding to hang up his boots and retire from the game. His last game was on 25 April 2009 at Thurrock, where he was harshly red carded for bringing down Tehokounte Malik in the final minutes. He moved with his family to Perth, Western Australia.